This morning, Srila Govinda Maharaj explains that today is Bahulastami, the Appearance Day of Sri Radha Kunda. It is also the anniversary of his taking sannyas. He is inspired to speak, and in a sweet and humble way, starts off saying that he took sannyas in 1985. But there is more to it. Two days before Bahulastami, Srila Guru Maharaj told him, "You take sannyas now or I will leave from this world." Srila Govinda Maharaj replied, "I will take sannyas on Gaura Purnima," which was a few months later. He smiles and continues, "I know that Srila Guru Maharaj never tells a lie, and if I say 'no' he will leave today." Srila Govinda Maharaj brightens and says, "Then I told him, 'Okay, I am your goat and now you can cut my head or my tail." The sannyas ceremony took place two days later. 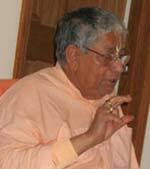 "After this Srila Guru Maharaj retired as a Guru," he says, pausing, "he became Param Guru." He laughs, "I started initiating officially on Gaura Purnima ." Then Sripad Siddhanti Maharaj mentions, "Srila Guru Maharaj initiated two devotees on your behalf." "Three," Srila Gurudev replies. "Madhavananda Prabhu had to go back to America and could not wait." So Srila Guru Maharaj said, "I am giving them initiation as a rittvik of Govinda Maharaj. But because I am his Guru I do not have to ask him for permission." "Thus Guru Maharaj acted in the proper siddhantic way," Srila Gurudev says. "This is a historical fact." We honor this memory in the glorious history of Sri Chaitanya Saraswat Math.